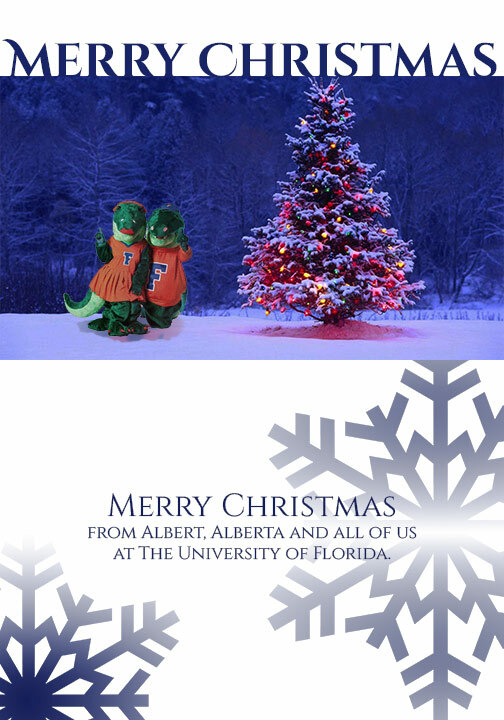 For our final Photoshop assignment, we were to make a Christmas card that the University of Florida or some sub-division thereof could send out. I decided to make it from the whole university. For this project, I found a nice Christmas scene and good picture of Albert and Alberta (our mascots). I then turned Albert and Alberta into a smart object so I could reuse them several times and not destroy the original image. In an attempt to make them blend in more to the photograph, I created three copies of them. On each copy I applied specific lighting effects to try to mimic a little of the lighting in the image. One of the layers for example, was adding a red glow from the right side of them. I then adjusted the transparency and blend mode of each layer to bring out just enough of each. I also applied a mask to the red layer, so that only parts of Albert and Alberta were highlighted in the red glow. I also created a faux shadow so that it seemed like they were more in the scene. And I applied a few photo filters to try to merge the scene and the mascots more. For the heading, I chose a decorative font that had a related normal font (which I used for the bottom message). I then changed the fonts to a dark blue that I pulled from the image. I set the heading just on top of the photo, so that it seems like it grew out of it. For the body copy, I set a white gradient behind it using a layer mask on a full white layer, so that I could more easily adjust the gradient. For the background snow flakes, I found one online, copied it’s shape and a added a gradient to the background. For the gradient I pulled the same blue as the fonts and a white, so that it fit better with the overall color scheme. And that’s pretty much it.